Alexis photographing his commission in my studio's garden! How wild is that? "It's noble to want to make a positive difference in people's lives, but it's ok if you only make a difference in one person's life. And it's ok if that person is yourself." I arrived back in Oakland, after months away, back to a disaster of an election result and got into my cab. A forty-something year old white guy was the driver; he was wearing a hawaiian shirt. His name is Norbert. He saw my bag and asked if I had just gotten back from somewhere, and I told him I had been on a long trip abroad. "I am so sorry you had to come back to this," he said, shaking his head. "But," he continued. "I got married last week. Do you want to hear about it?" Oh, I did. And he told me everything about his wedding. He got married at the zoo. His wife wore a pink dress. I thanked him when I got out of the cab, for that piece of decency. A few days later I told this story to a friend on the phone, and just started crying. In the middle of the sidewalk, I just couldn't stop, I couldn't even finish the sentence. January 26, 2017: Can you see me? As I biked to work at 6 in the morning, I passed a man on the opposite side of the street to me. "Hey, lady!" he yelled, I turned. "Can you see me?" he asked, frantically, unsure of his existence and reality. "Yes!" I yelled back and kept biking. I was biking down the street to the studio today, and as I reached a red light, started hearing some weird music coming from the truck ahead of me. As I pulled up next to it, I realized it was a kid practicing his trumpet out the passenger window. I saw a boxing movie tonight with some friends, and while rode home on empty streets, feeling invincible. Do you ever wonder how you'd do in a fight? Biking home, I smelled the pleasant smell of wood burning. A few minutes later, I heard sirens, and a firetruck passed me. Looking ahead, I saw a smoke rising from a neighborhood, and felt really queasy. I'm lucky to have some friends that I do. One of my good friends from DC emailed me to arrange a phone call, out of the blue. I haven't had a real conversation with him in months. On the phone he told me that as an introvert, it's really hard for him to call people. It's uncomfortable. Extroverts often have the same discomfort. But my friend has decided to address it head on - just because we don't live in the same part of the country doesn't mean we shouldn't be close friends. That will not be my last phone call with him, and I am proud to call him my friend. I have extremely vivid dreams. Last night I had an especially strange one -- in all of my dreams, I've always been me; which I think is 'standard' for a lot of dreams. If I have dreams about seeing acquaintances in weird places or the world ending, I am still me in the dreams - my identity as Fawna has not changed. But in this dream, I was a totally different person. I was a Muslim woman in her mid-forties, married to an Arabian diplomat, with three sisters, and a marmalade cat that wore a blazer (and who required constant grooming because he had spiders growing in his fur). I remember looking in the mirror in the dream and seeing a totally different face and answering to a totally different name. Coming out of that dream was really, really difficult. It felt like someone had swapped dreams with me. 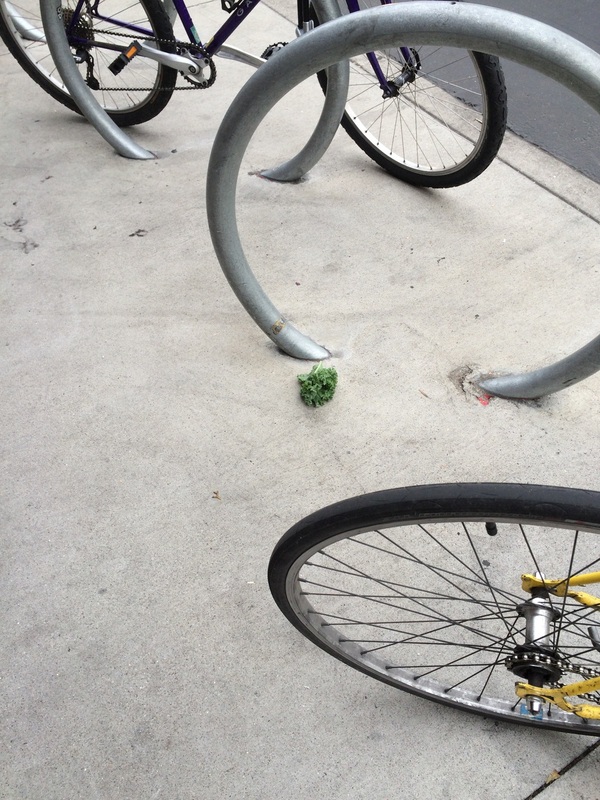 Sad little kale bunch got left behind at the bike rack. I woke up in the middle of the night last night because of how intensely it was raining - it felt like someone was throwing rocks at my windows. And then I saw the lightning - because of all the windows in my room (and the skylight above my bed) it felt like someone was flicking the lights on and off. It was incredible. I saw this today and couldn't stop thinking about it. I was talking to a friend of mine, a large guy who looks like a Samoan wrestler, about rudeness. "I don't know what I would do if someone was mean to you," he said thoughtfully. It's my birthday. Birthday's are weird. But I remembered what a friend told me about turning 26: "26 was my favorite year!" He said. "That's the year I realized who I was." 25 was an incredible year of getting lost, here's to 26 being an incredible year of getting found. My room is very cold in the morning. I haven't had to be anywhere in particular the past couple days and it's felt strange. This morning I woke up and could not convince myself that getting out of bed was a better idea than watching the light change in my room. Drinking sake at a tiki bar, talking to my beautiful roommate about her handsome boyfriend. I sent out an email wishing some people a happy thanksgiving today, and wished that everyone was surrounded by love and food and noted that I was in the midst of a moat of pies and lasagna. "Is the collective noun of lasagna, 'moat'?" is what I got back. I chat with this woman Lou almost every week. She's an older lady with electric orange hair and an easy smile. She's a registered nurse and a therapist for youth with schizophrenia. I asked her about Thanksgiving, and she got a bit sad at the thought of not seeing her patients over the week, especially during what is one of the more difficult weeks for many of her patients. It's easy to forget that some holidays mean totally different things to other people, and the idea of sitting down with family and friends is something that isn't a reality for many people. Lou is a gem. I see her hugging giant, tattooed men in the streets all the time, patting their cheeks, smiling. It's been raining a bit here the past few days and when I stuck my head outside today, I realized that my garden is EXPLODING in green sprouts. Seeds planted months ago are germinating. Carrots are sprouting in places that I accidentally spilled carrot seeds. Fall in California means I can still harvest chard from my garden at the end of November.